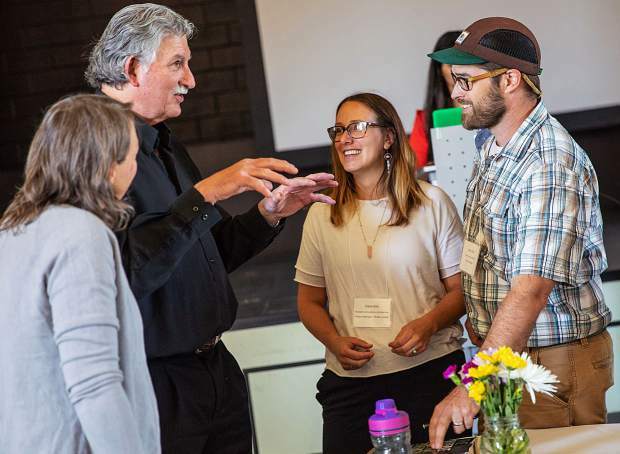 Architect Ed Mazria explains his ideas for reducing carbon emissions from buildings during a break at the Building(s) for a Sustainable Future symposium held Friday, May 18, 2018, at the Third Street Center in Carbondale. Listening are Gwen Garcelon, left, and Dana and Isaac Ellis. CARBONDALE — Architect Ed Mazria, speaking Friday, May 18, presented his strategy for the world’s buildings to operate only with built-in efficiency and renewable energy by 2050. Mazria is the founder of Architecture 2030, a think tank in Santa Fe, New Mexico, that develops plans and policies for cutting carbon emissions from buildings worldwide. His keynote talk led the Building(s) for a Sustainable Future symposium, which drew 160 architects, builders, elected officials and staff from Garfield, Eagle, Pitkin and neighboring counties. The symposium was hosted by CLEER, CORE and Garfield Clean Energy. Buildings consume 40 percent of energy in the U.S., and from 60 to 75 percent of energy in cities, Mazria said. Mazria’s strategy aims to eliminate carbon emissions from buildings by 2050, with policies focused on new construction, existing buildings and renewable energy. “All new buildings can be ‘zero net carbon’ tomorrow. There’s no magic in it,” Mazria said. The latest energy codes, if followed, produce buildings that use two-thirds less energy. The remaining energy demand can be met with renewable energy, he said, which would create a predictable market for clean energy development. Mazria will unveil his “Zero Code” proposal for new buildings at an international conference in September; his presentation in Carbondale was the first in a series of previews across the U.S.
At the same time, Mazria said, the U.S. must accelerate the pace of energy retrofits on existing buildings, which also boosts business for contractors. Today, about 1 percent of buildings undergo a deep energy retrofit each year. Stepping that up to 3 percent per year over the next 30 years, he said, would retrofit almost every building that exists today by 2050. Other speakers at the symposium talked about efforts to build homes that use less energy, emphasizing ways to make energy-efficient housing affordable for all. Rebecca Foster, of the Vermont Energy Investment Corp., showed the company’s zero-energy modular homes, designed for hurricane survivors. Built on a foundation to qualify for a conventional mortgage, with 10-inch walls, solar panels and a heat pump, Foster said occupants save about $3,000 a year in energy costs. Kelly Vaughn, of Rocky Mountain Institute, said RMI’s Realize program aims for deep energy retrofits on whole neighborhoods. Realize is inspired by a Dutch program that has retrofitted 6,000 homes, using an economical model that packages finance, labor and materials on a neighborhood scale. “A net zero home is not only more cost effective, it’s more comfortable and easier to operate,” Vaughn said. The symposium concluded with comments from leaders from the three-county region. Matt Hamilton, sustainability director for the Aspen Skiing Co., challenged leaders to take a role in helping coal-based communities such as Hayden and Craig “ensure their future economic viability” as power sources shift to clean energy. While the strategy requires international buy-in, especially as new construction ramps up in South America, Africa, India and China over the coming decades, Mazria insists the change must start now in the United States. “The U.S. is where all the world looks for what to build,” he said. If all new buildings followed this model, then global building energy consumption would stop increasing within a few years, he explained. In addition, market demand for renewable energy systems would become predictable. Governments would need to enact policies requiring retrofits when properties change hands or undergo other substantial remodeling, he said. Mazria noted that combining energy retrofits with other upgrades reduces retrofit costs by about 25 percent.